We’d love your help. Let us know what’s wrong with this preview of Half a Wife by Gaby Hinsliff. For most families, it remains the ultimate dilemma: how to balance a happy, healthy family life with the demands and rewards of work. When Gaby Hinsliff realised that she couldn't continue to work 60-hour weeks, spend time with her child and expect to stay happily married, there was only one solution. She quit, and decided to start again from scratch. 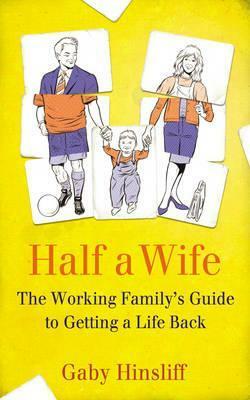 Half a Wife tells the For most families, it remains the ultimate dilemma: how to balance a happy, healthy family life with the demands and rewards of work. When Gaby Hinsliff realised that she couldn't continue to work 60-hour weeks, spend time with her child and expect to stay happily married, there was only one solution. She quit, and decided to start again from scratch. Half a Wife tells the story of that leap into the dark and proposes positive, practical solutions for piecing together what at times can seem like an impossible jigsaw. It encourages working parents to rethink traditional set ups - at home, at work, in relationships - to the mutual benefit of the whole family. The result? A much more egalitarian family life, where both partners can work if they want to, both share the care and both get back a little bit of a life as a result. Based on personal experience but also drawing on new thinking from politics, psychology, anthropology and even architecture, Half a Wife is a guide for guilt-torn parents who are teetering on the edge, but it is also a wake-up call to opinion leaders. It is essential - and uplifting - reading for anyone who feels the visceral pull of home, but also the lure of meaningful work. To ask other readers questions about Half a Wife, please sign up. Hallelujah, here is a book not joining the interminable argument about if and how women should work and how you must feel guilty if you've made a different decision to the arguer. Rather its premise is that of course parents - note, _parents_ - want to spend time with their kids and of course parents want meaningful work outside their kids (not necessarily outside the home), and what are ways of making that happen outside the current 80-hour-work-week norm. Really interesting book examining childcare, working women and society at large. Gaby H for PM. Essential reading! Well thought out and a convincing argument.